With their bold outlines, bright colors, and simple shapes, the paintings of Charles Munch look cartoon-like. But the Wisconsin artist’s messages of environmental conservation and man’s often contentious relationship with nature are quite important. As he canoes, bikes and hikes through Wisconsin, Charles Munch appreciates how sunlight hits the scenery. "The air can be crystalline in the light and the air is much cooler," he said. Munch, who calls himself sensitive to color, paints nature scenes of the Midwest that vibrate with the tints and shades he mixes with extreme precision. The paintings by Charles Munch can be thought of as nature icons, that is, images conducive to meditation on questions that may have no answer but are worth exploring. The mysterious stillness inherent in painted images encourages meditation on the twin riddles: What happened before? & What will happen afterwards? Munch believes that the more deeply we explore our relationship with other animals and the rest of the natural world, the healthier the world will be. The use of bright, clear colors and simplified shapes, convey a distinct image by the plainest means possible. Eliminating extraneous details, allowing room for the expression of emotion through the abstract elements of color, line, and shape. He depicts his subject with barely enough description to make it recognizable, and then brings it to pulsing life through vibrant color relationships and dynamic compositions. Creating images that are even truer to his vision of nature and the emotions about it than a realistic painting could be. 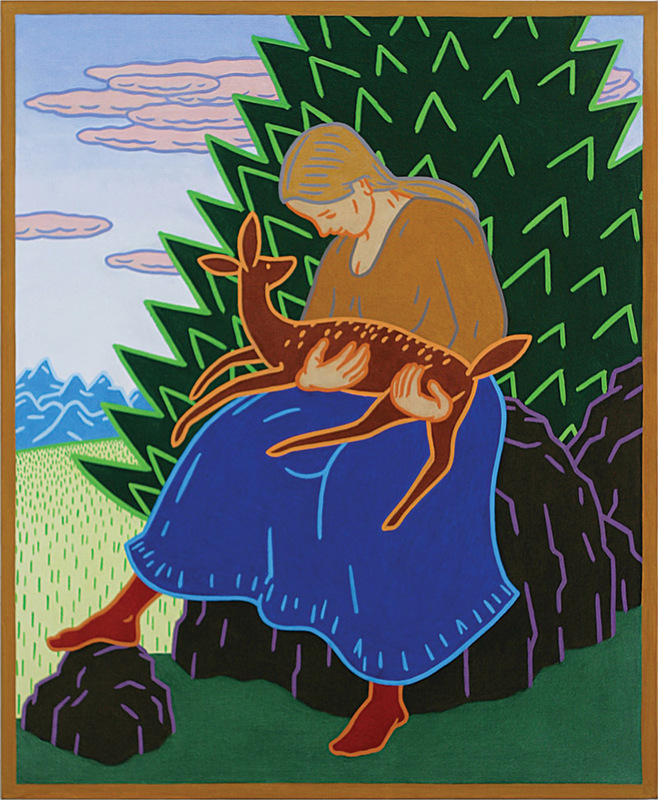 Thursday October 2 through Friday November 21, 2014 in the Besse Gallery, Bay College, Escanaba, MI. “Wind River, ” a new painting by Charles Munch for our Summer in Wisconsin exhibition embodies many of the issues that interest Munch. As he says, “I really do want people to care about what nature is. I want people to be more in tune with nature as one of the big forces in the world, something to be reckoned with, to be respectful of, to take pleasure from. It is not just something to be ignored, exploited, or conquered.” As in many of Munch’s paintings, human and animal life interact in an enigmatic fashion surrounded by a meticulously painted landscape. Charles Munch’s penchant for color comes from his training in art conservation, where colors cannot be approximate, but must be exact. Brush strokes are purposely made as smooth as possible, lending more importance to color and the reductive composition. Wind River measures 39 inches tall by 63 inches wide, and like all of his large work, the details have been carefully worked out in a much smaller version.